By Ann Webb Price, Ph.D.
One of the many things AEA does is to sponsor a blog called AEA 365. AEA members post a blog each day that highlights specific techniques, resources, and tips for evaluators. 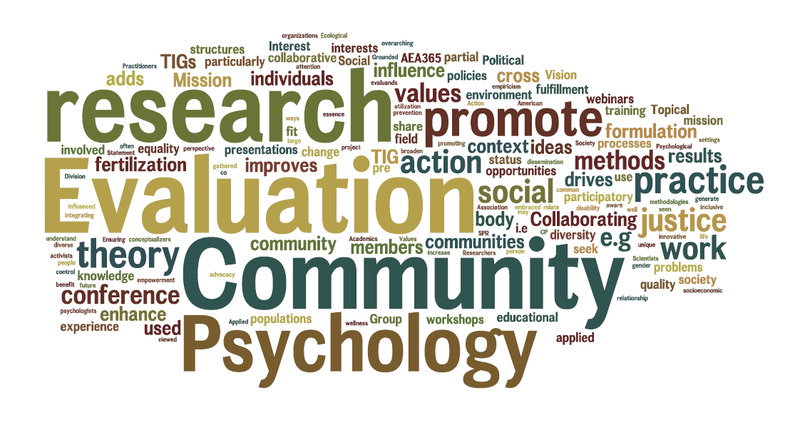 The following week (March 23-28), the CP TIG is hosting AEA 365 blog and guest bloggers will be discussing evaluability assessment. The blog series should prove to be illustrative with evaluators such as former AEA president Deb Rog, Jim Altschuld (author of the Needs Assessment kit through Sage), Rob Fischer, Co-Director of the Center on Urban Poverty and Community Development at Case Western Reserve University-CWRU, and Julianne Manchester, Principal Investigator for the National Training and Coordination Collaborative (CWRU) sharing their views on conducting evaluability assessments. Be sure and check out our postings at http://aea365.org/blog/ and share them with your friends and colleagues. You can learn more about AEA at www.eval.org If you are member of AEA already, please select the Community Psychology TIG on your membership page.